LONDON, April 18 (APP):Prime Minister Shahid Khaqan Abbasi Wednesday pointing out a significant reduction observed in the overall incidence of Plasmodium falciparum cases by more than 80 percent between 2013 and 2017 in Pakistan, said his country through its enhanced efforts and support of donors and partners remained committed to the fight against malaria. “We have started mobilizing domestic resources and investing in the control and elimination of all communicable disease. 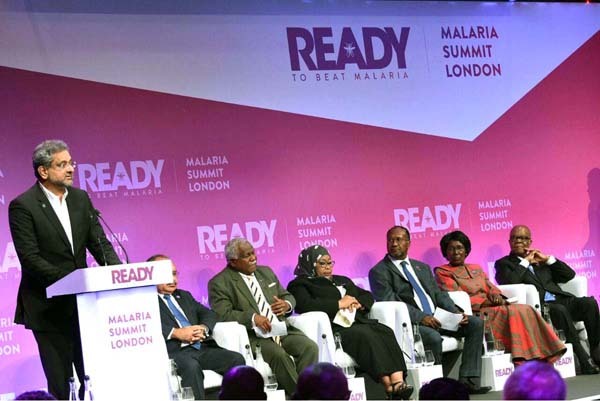 The allocation for malaria control by the provincial governments has substantially increased and more than doubled in the last few years,” the Prime Minister said while speaking at the Malaria Summit held here alongside the 25th Commonwealth Heads of Government Meeting (CHOGM 2018). Prime Minister Abbasi termed the summit “a timely initiative” and said despite challenges, the malaria control interventions in Pakistan were aligned with WHO Global Technical Strategy (GTS 2016-2030), adding, pursuing universal health coverage, malaria diagnostic and treatment services were being expanded to rural and far flung areas to cater to the needs of general population and marginalized communities. He said expansion in diagnostic coverage was mainly being done through the provision of Rapid Diagnostic Test kits. Private sector was also being engaged for free of charge malaria case management interventions, he added. The prime minister said the reduction of Malaria incidence was mainly attributed to the high impact interventions such as the use of Artemisinin based Combination Therapy and Long Lasting Insecticidal Nets (LLINs). Plasmodium Vivax has proportionately increased to 85 percent, he added. The prime minister said since 2013, around 12 million free of charge LLINs had been distributed in highest endemic areas of Pakistan. He said Pakistan was among the high Malaria burden sharing countries in WHO-Eastern Mediterranean Region, adding, Malaria each year caused significant ailments, deaths and economic losses. The prime minister said that Pakistan had established a cross border malaria network with Iran and Afghanistan to effectively coordinate and collaborate malaria control efforts in the bordering areas of the three countries. “In addition, we have joined hands with Asia-Pacific countries through Asia Pacific Leaders Malaria Alliance (APLMA) to re-affirm our commitment of malaria elimination from the region. Let me assure you that we will further enhance our efforts for complete elimination of Malaria both through increased resource allocation, in spite of many competing demands, and better coordination and management,” he maintained. The prime minister said Pakistan sincerely appreciated the existing cooperation with WHO and Mallinda and Gates Foundation and looked forward to deepening and enhancing its engagement to augment its existing capacity. The Prince of Wales, delivered the keynote address, while Bill Gates also spoke on the occasion. The summit was also addressed by leaders of various Commonwealth member states including Gambia, Ghana, Guyana, Kenya, Malawi, Mozambique, Namibia, Uganda, Solomon Island, Papua New Guinea, Vanuatu, Tanzania and Zambia.